All Forbestown homes currently listed for sale in Forbestown as of 04/23/2019 are shown below. You can change the search criteria at any time by pressing the 'Change Search' button below. If you have any questions or you would like more information about any Forbestown homes for sale or other Forbestown real estate, please contact us and one of our knowledgeable Forbestown REALTORS® would be pleased to assist you. "Rare Mountain Home Opportunity! This place is awesome! A total of 42.88+/- acres with end of road quality country home, large shop & 5 total legal parcels backing up to forestry land. End of road to this properties paved circle driveways. Pavement leads to front of shop and loops around to access homes 4 car garage. Garage consists of large double entry 2 car and a single entry for 2 cars deep which would be ideal for boat parking. Excess cabinet space with 2 man doors and half bath in garage. Interior with 3 bedrooms, 2 bathrooms, central hall, kitchen with ample cabinetry and seating bar, living and family areas. Beautiful efficient wood burning free standing fireplace with brick hearth. Window views from every window. Front covered porch with fanned gazebo. Large rear relaxation deck. Beautiful large well equipped shop with power, overhead storage and shelving, large auto roll up door and roll up door access utilized to store the Polaris ATV (Included) to assist in accessing your new property. Home itself sits on 4.53+/- acres. Between the homes parcel and Forestry owned land sit 4 additional legal parcels. Consisting of 7.63, 9.57, 9.6 & 11.55. Numerous trails exclusive to this property derivable by ATV. Many property markers. You own your own forest here with beautiful White Fir, Madrone, Oak, Doug Fir +. Hunt, recreation, relaxation, year round. Literally access forestry roads from back of your land. Creek for gold panning. Backup generator. An overall unique offering." 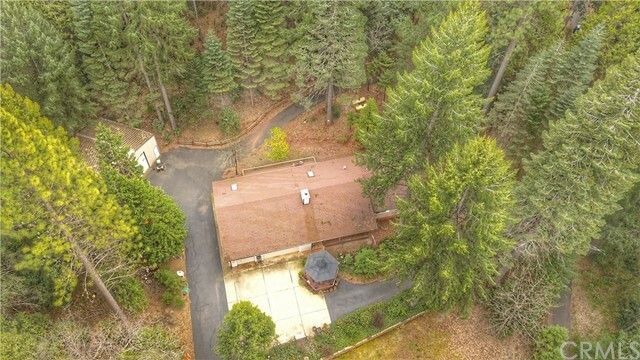 "This is an exceptionally maintained, very private, 10.2 acre lot that features two manufactured homes! The homes have different parcel numbers but are being sold together. 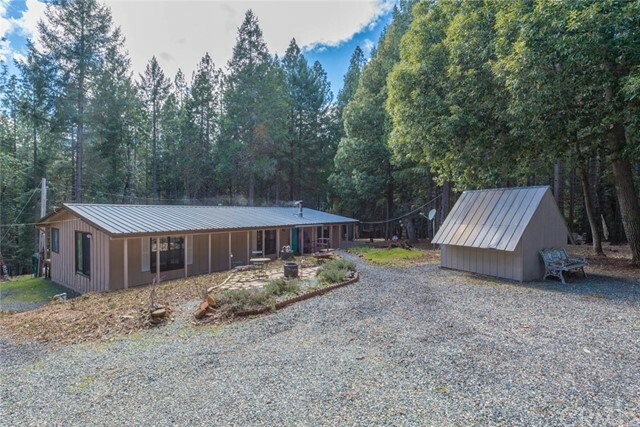 Located in the foothills of Forbestown, CA, just 30 minutes from downtown Oroville, this property is perfect for outdoor activities. Entrance to the property through a heavy duty gate reveals a large metal hanger style shop/garage, two out buildings, a small barn and detached deck with six-person spa. Access roads are built in around the property as well as fire breaks. The main home is 1680 sq. ft with two bedrooms, two bathrooms plus a den. It features upgraded custom tile in the kitchen, utility room and master bathroom. The home contains a wood stove in the living room, newly constructed front porch and walkway and is topped with a metal roof and solar panels. 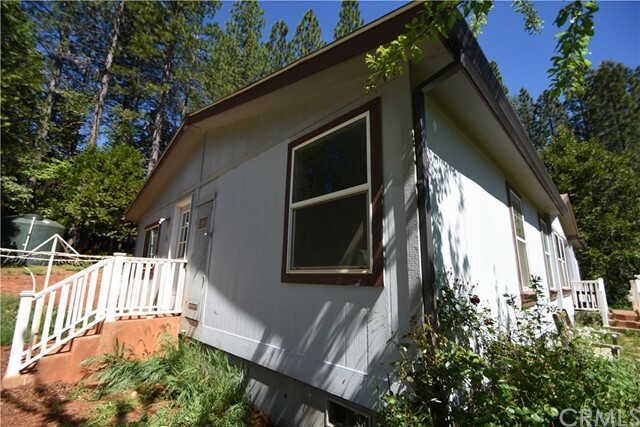 The second manufactured home is built in 1994 that is used as a mother in law unit featuring three-bedrooms, two baths and is 1200 sq. ft. This home has front and back screened in porches. Both properties offer central heating and air as well as Satellite TV and internet." "Rural Home Situated on 4.75 Country Acres Get this manufactured home set back from a paved road (about 200 yards off the pavement )with easy access, the home is perched above the open meadows for views of the meadow below with its gently rolling property and ample space to accommodate agriculture, animals and outbuildings. Convenient to shopping, services and recreation, this redefined retreat with an open floor plan and inviting living/entertaining areas is ideal year round or for weekend getaways. The peaceful, private property visibly combines overall appeal with amazing affordability."